Just what it looks like in the photos. Gives good light with 5 clear round bulbs in them. Make a statement with this one-of-a-kind globe chandelier. This metal chandelier channels the best of both classic and modern style, with an antique-bronzed in finish and a decidedly eclectic round shape. 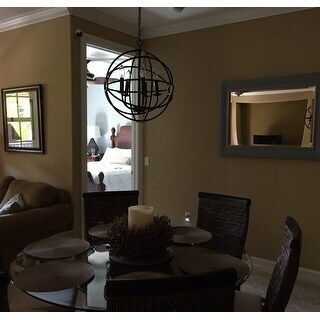 This five-light chandelier is a great conversation piece, and it gives a warm glow to any living room, den or study. Update your home and make a dramatic statement with this attractive Benita globe chandelier. Crafted of iron with an antiqued bronze finish, this lovely chandelier is the perfect lighting addition to your home decor. Enjoy creating the right ambiance for parties and family gatherings with the warm glow that exudes from this hanging light fixture. Considering similar looking, although not exactly the same chandeliers, at other high-end stores run for much more this is a great deal. It's not too large but good enough for a medium sized room. Mine is installed in a 10x15 room and is just the right size. For a bigger room it may be too small. The only beef I have is the paint did chip off in spots during installation since I was handling it a lot but you don't notice it when it's hung since the metal is black underneath. I used 40 watt bulbs and it casts a nice soft glow to the room. The metal does create a shadow onto the walls so not really bright enough as the only light source in the room unless you are looking to create ambience. Manufacturer recommends not to go higher than 60 watt bulbs but they might make the room brighter. I love the industrial looking vibe it gives to my otherwise traditional looking room. the Benita 5-light Antique Black Metal Strap Globe Chandelier is an absolutely beautiful addition to any home. It makes a statement simple yet elegant, truly a must have! We purchased this light fixture to replace a 12 yr old builder grade chandelier in our front entry way. 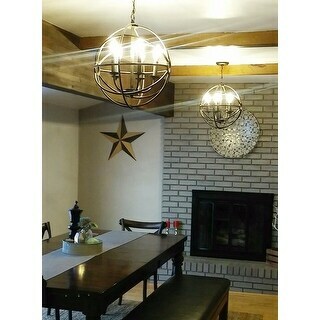 We are getting our house ready to sell and this type of light fixture seems to be in all of the home improvement shows on TV. I'm very pleased with the fixture, it came securely wrapped in the packing box and only took my husband a short time to install. It gives off a lot of light and I think it adds a little something to the entry way. I had such a hard time finding a dining room light that I really liked. I looked at retail chain stores, local lighting supply stores, online venues...nothing that really spoke to me making me want to spend a lot of money. One fixture that was similar to this one in a local store was about 5X the price, and much larger, so I was hesitant to commit to it. Would it really fit in the space? Or would I be sorry I spent that much money? Another was perfect, and more expensive, but antique bronze while I was determined to find black. So I took a chance on this light and have to say, it is well worth the price. 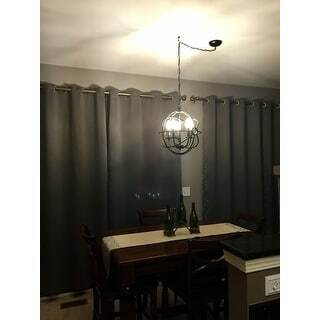 I like the design - true that close up it isn't the quality that some more expensive lights would be - but it looks so updated compared to the 90s style fixture that came with my townhouse that I rated it a 5 for style, design, ease of installing and overall value for the price. I bought two for my kitchen/dining. My home was built in the 70's and had a rather outdated look. 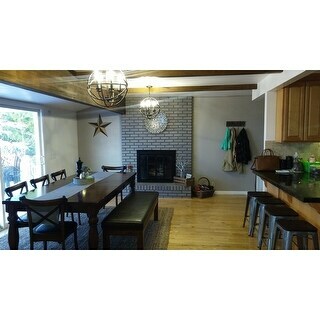 Though, just adding these lights to the room not only made it brighter but appear a much more modern rustic look! Love the quality and it arrived pretty quick. I would recommend. I normally don't write reviews but I want to let everyone know how much I love this chandelier! It has the right amount of antique to it, and when on, casts a beautiful glow into my master bedroom. Definitely has enough light to light my room, and actually the bulbs I had were only 40W. If you're thinking about this, buy it, you won't be disappointed. This light fixture is very chic. Assembly was very easy. It took my husband and I a total of 30 minutes to install. The color of the fixture was not antique bronze, it was matte black with metallic paint dry brushed on. It did not bother me that much because it did not take away from the beauty and quality of the fixture. This is a beautiful fixture, the picture on here does not do it justice. It is not actually a black, more of a dark brown. It reminds me of an oil rubbed bronze; though it lacks the sheen. I have 60 watt GE candelabra bulbs in the fixture, and it puts out a lot of light, so if you want a less intense light, go with a lower watt. The price is very reasonable and the best I have found on this style, as there was another globe chandelier I was eyeing at ***** that was much more expensive, and it was the same size. I got this light for our study, and it looks great! It is adjustable, so it can be hung at any length needed to fit the room. The antique black metal is a nice touch. Great fixture for the price! I am very pleased with this fixture. It is a bit smaller than it appears in the pictures but it works well in my small dining area. As soon as I opened the box I was surprised at how nice this chandelier is. It is a perfect size for our dining room. Pictures do not do it justice. Very happy with my purchase. An affordable alternative to restoration hardware. Unfortunately, 2 of the 5 candles are bent which I did not realize until the fixture was installed. I still like the light. But, the bent pieces will drive me crazy forever. An excellent price on a fixture that's a ringer for others at far more expensive places. The tubes do have a single hole where they connect near the ring (on the inside--it isn't notieceable), but for 10% of the price of the others it doesn't bother me one bit! Well made easy to install. Husdband had to cut some of the chain off but it was very easy. It took him about 20 min. to install. This worked very well in my dining room. The light is so stylish and modern. 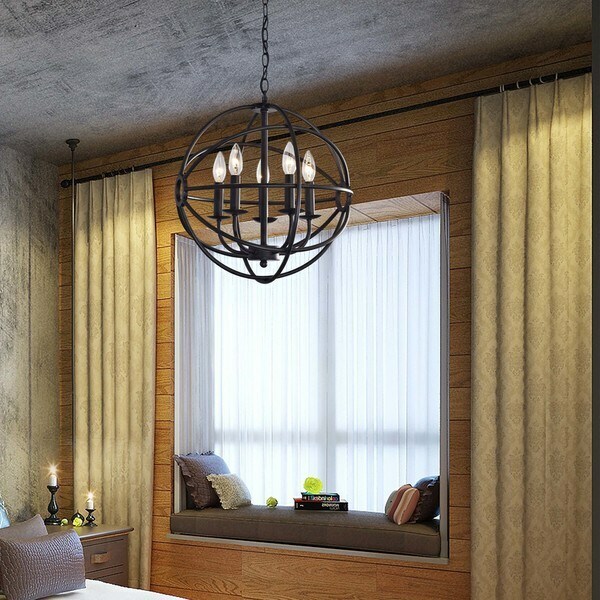 This light instantly adds appeal and design to whatever room it is put in. Highly recommend! You will love it. I absolutely love it! It’s perfect over my dining room table and installation was super easy! It looks more expensive than what it is. I love Overstock! This chandelier was reasonable, yet looks expensive. I put it in my foyer and it looks great. You have to buy the special light bulbs to complete the look. I cannot say enough about how much I love this light! I had read some reviews on some of the light bulbs being off center, but that was not the case for me. This light was perfect. I've had it up in my kitchen for almost a year and no problems. I'm even getting ready to move and taking this light with me to my new house. Would buy again! love the modern look of this chandelier. we put it in our entry hall. it gives the perfect amount of light. it goes with our transitional decor and makes a statement when people enter our house. Very happy with the chandelier--it's a solid, heavy metal and the price compared to others was very good-I will be spray painting it an antique pewter color to coordinate with my other light fixtures, as I couldn't find it in a different color at a reasonable price. I do really like this new light over my kitchen table. My husband was easily able to assemble and hang it. My reasons for not giving it 5 stars would be two. First, the pieces that hold the bulbs were a little bent off kilter, so I had to straighten them myself, which was easy enough to do. Second, the diameter of these pieces is such that I was unable to find LED bulbs that fit into them--the silver base of the LED bulbs was the same diameter and so would not fit into it but just to the edge. I ended up using non LED bulbs for this reason as I did not like the silver base revealed above the dark color of the structure. Love this fixture. Timeless style. Put it in a stairway landing and it is the perfect amount of light plus the shadows that play off the wall look cool as well. "What is the diameter of the mounting piece to the ceiling?" "Does it look black or brown when hung?" It looks black when hung. Hope it helps. "What is this additional copper wire attached to the light fixture? Where does it go?" This additional copper wire attached to the light fixture is the ground wire. It goes to the junction box on your ceiling. "Is this a dimmable LED light"
Whether it is dimmable or not depends on the light bulb not on the light fixture itself. If you use dimmable light bulb and a dimmer switch, it will be dimmable. "is this fixture UL approved? Does it have a UL label on it??" Yes. I have one and could'nt remember if it was listed or not. Took the canopy down and it had a sticker in it UL approved. This fixture is ETL listed, not UL. It has ETL label on it. "Could this be hung in a steamy bathroom over a tub?" No, this can not be hung in a steamy bathroom over a tub. "Can this be hung outside on a covered porch?" Sure...it's metal and if your porch is covered I foresee NO problem.. I'm not sure electrically if it could be on a covered porch. The only thing I would say is to be certain of the size...it is MUCH too bid for having in my foyer with9 ft ceilings. The dimensions shown are not accurate at all. I loved the lamp on line but so disappointed it is so huge. I plan to take it down and return it.